AUSD's Annual Career Fair will be held at Mark Keppel High School on Thursday, February 7th from 2:00 pm - 5:00 pm. Please click on the headline for more! Hello to the SGHS Community! 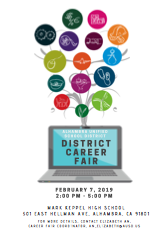 The AUSD's Annual Career Fair will be held at Mark Keppel High School on Thursday, February 7th from 2:00 pm - 5:00 pm. All High School AUSD students are invited to attend. Transportation to MKHS will be provided from SGHS. There will be Free Workshops, Mock Interviews, Part-Time Job opportunities, Internships and Career Speakers from over 50 Companies. Have you considered a career in Nursing, being a Ocean Lifeguard, a Helicopter Mechanic, or a Chemical Engineer? Stop by the College & Career Center today to pick up a permission slip, and a boarding pass to ride the bus from SGHS to MKHS!